Nick Powell is a handsome young writer with a future as bright as he is. Then one tragic night he's brutally attacked and left for dead - but he's really not. He's trapped in a ghostly limbo where no one can see or hear him except Annie, the one person who might be able to save him. They must work quickly together to solve the mystery of his murder before it is too late and Nick's chance to live again is lost forever. “The Invisible” only earned a measly US$26 million throughout its domestic run back in April and to make things worse, it was never picked up by the distributor for general screening in Singapore. Rottentomatoes gave it only a 20% freshness, one critic even called it “ludicrous”. Is it that bad? Directed by David S. Goyer, the man behind the famous JSA comic series and notably also scribed the popular “Blade” franchises, cult movie “Dark City” and of course a huge mammal, “Batman Begins”. His third directorial attempt surprisingly is low-key and non-comics inspired. Basically, the premise is a rework of a 2002 Swedish movie, Osynlige, Den. In the Hollywood version, a young bright student Nicholas Powell, played by Justin Chatwin (he’s the son of Tom Cruise’s character in “War of the Worlds”) is mercilessly pummeled and threw down a hole by his attackers. Catch is he’s not dead and he has this out-of-body experience, he can see everyone but not the other way round which explains why we have this silly credit on the DVD cover, “From the producers of The Sixth Sense”. Somewhere out there, someone is resorting to some desperate measures to hard sell the DVD to recoup some losses. “The Invisible” does have credits of its own but please refrain from popping in this DVD expecting shocks, scares along the line of the M. Night Shyamalan’s famous thriller. Seriously, you can’t classify “The Invisible” as horror thriller simply it isn’t. It’s not a teen romance drama either. The pacing is at best leisure, it could trim down at least 10 minutes or so and it doesn’t lose any crucial plot points. Nicholas at the same time doesn’t go through walls as per any typical ghouls portrayed in movies so you can rule out any effects spectacle. He’s just there trying hard to establish contact with his mum, his best friend Pete and his attacker Annie, a problematic schoolmate who has domestic problems of her own. As it progresses, the relationship between Nick and his mum sticks on you. He never knew his controlling mum actually loves him a lot. It does help that “mum” is played by Academy Award winner Marcia Gay Harden and Annie, the troubled girl who has a soft spot for his younger brother. This is Goyer’s attempt at a solemn, paranormal piece. I have not seen the original material so I can’t really do a straight-out comparison and I doubt Goyer is doing a per se ghost story. 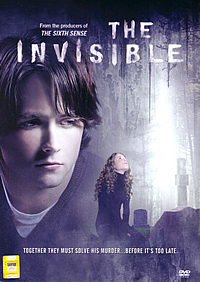 Stripping bare of any effects extravaganza, teen sexuality, “The Invisible” is a nice fresh attempt at storytelling using a character that’s not suppose to exist. Now all it needs to do is to find an audience without remaining invisible. In the Audio Commentary with Director David S. Goyer and Writer Christine Roum, Goyer and Roum made a lot of references to the original Swedish movie. They discussed scenes which are lifted from the original and why certain scenes, characters are added. Trivia points as in how bitter-cold the weather are while they are filming and which scenes utilizes subtle visual effects are also mentioned. There are also 4 Deleted Scenes with Optional Commentary with Director David S. Goyer and Writer Christine Roum. All of them are completed sequences not as in rough cut. Tune in to the commentary if you wish to know why they are excised. 2 music videos one by Thirty Seconds to Mars ("The Kill") and Sparta ("Taking Back Control") and a few obligatory Disney trailers round up this Code 3 DVD. Goyer’s original intention was to make the movie a bit darker but the end product is as good as it is. Most of the shots are dim and dark but the DVD transfer did a fair job replicating it onscreen. There isn’t much activities taking place that requires much of the stereo but at least the dialogue is of utmost clarity and Marco Beltrami’s score is pretty soothing. In addition, this DVD offers at least 5 languages option.